A Special Issue on Generations of Artists and Art Professionals in Family or Mentoring Relations. 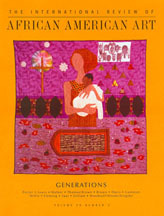 Articles: “James A. Porter Meets Henry O. Tanner”; Norman Lewis-Tarin Fuller: A Stormy, Very Loving Relation”; “On Walls and the Walkers” (artist family: Larry, Kara and Dana Walker ); “Generations: From Hilda Wilkinson Brown to (neice) Lilian Burwell” ; “Growing Up with Art All Around” (artists Malcolm and daughter Rhonda Brown); “Hampton Generations Living in Art” (how growing up in a creative home on the campus of Hampton Institute inspired generations of art collectors); “Bridging Generations: Reminiscing With Reggie” (A Young Artist Raps with Reginald Gammon); “Picturing Us Together: Deborah Willis and Hank Willis Thomas”; “The Flemings (John and Tuliza), A Force in the Museum World”; “Wonders of the House of Saar” (Betye Saar and her artist daughters); “Sam and Leah Gilliam. Like Father, Like Daughter? Yes and No”; “From Woodruff to Grigsby to Woods, A Cross-Generational Holiday Tradition (three generations of artists in a mentor/protégé relation).